OWU’s Seth Clark slices between a pair of Denison defenders for a layup during the first half of Wednesday’s NCAC showdown at Branch Rickey Arena in Delaware. Chris Allocco and Grant Gossard each had a pair of layups and Seth Clark hit a three-pointer as part of a 13-2 run to start the second half and the Ohio Wesleyan men’s basketball team cruised from there. 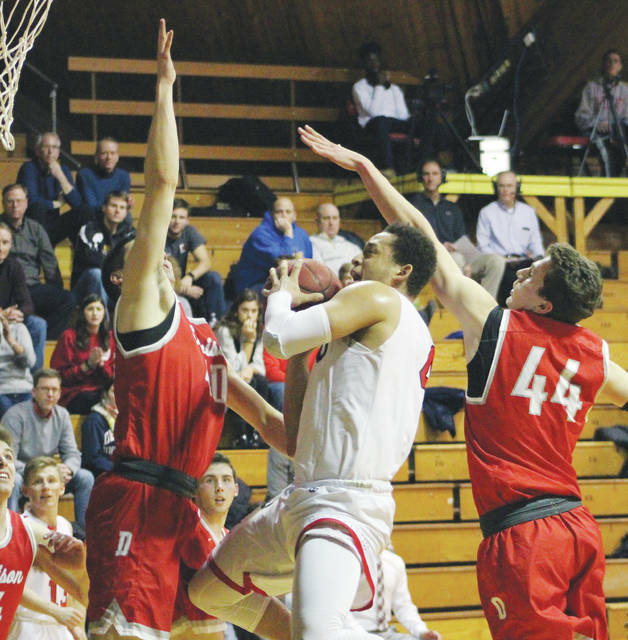 The three was one of six by Clark, who had a game-high 30 points to lead the ninth-ranked Battling Bishops to an 89-70 victory over visiting Denison in NCAC action Wednesday night at Branch Rickey Arena in Delaware. OWU went into last week as the 14th-ranked team in the country according to D3hooops.com, the host of last week’s event in Vegas. The Bishops beat sixth-ranked Ramapo before putting top-ranked Whitman’s feet to the fire before falling late. “I thought (these close games) would kind of define us as a team – are we going to gut it out — and I think we did (tonight),” DeWitt said. Clark scored seven during a 10-4 run to push the lead back to 10 with 12:51 left in the game after Denison had cut it to four. Adam O’Brien’s jumper pushed OWU’s lead as high 22 late in the second half. Nate Axelrod had 18 points and eight assists, Allocco had 13 points and six rebounds, Gossard added 10 points and 10 boards and Derrick Wyche chipped in eight boards to go with six points for the Bishops (10-2, 5-0). Matt Doyle and Johnny Vernasco each scored baskets on Denison’s first two possessions and the Big Red led by as much as five on a Garrett Collier three-point play at the 13:30 mark of the first half. Wyche found a cutting Allocco to cut the OWU deficit to two with 11:58 left in the first half. Neither team led by more than two points for the remainder of the period. Collier beat the buzzer with a turn-around jumper in the low post to give Denison a 38-37 lead at the break. “I thought we just didn’t pay enough attention to detail on defense and they got some confidence,” DeWitt said. Maxwell Siwik had 23 points and eight rebounds, Collier added 13 points and 14 rebounds and Jack Coulter finished with 11 points to lead the Big Red (7-5, 3-2). Next up, OWU hosts Wooster in NCAC play Saturday afternoon at 3 p.m.
Denison used a 7-0 run in the first quarter and never relinquished the lead again in handing host Ohio Wesleyan its fifth straight defeat in a 63-55 victory in NCAC action Wednesday night at Branch Rickey Arena in Delaware. Lauren Hofer’s three-point play highlighted a 7-0 run in the first quarter that broke a 4-4 tie. OWU got it as close as one in the second before Denison ran off six straight and extended the lead to 35-24 at the break. Brittany Atkinson hit a pair of three-pointers and Lauren Longbrake added a couple of baskets, including one that beat the buzzer to end the third as Denison stretched its lead to as high as 18 in the fourth. OWU chipped away in the fourth, using runs of 8-1 early and 9-1 late in the frame to get it as close as six. Claire Sterling had a couple of layups and Tia Karras knocked down a jumper in the late rally. Hofer, an Olentangy Liberty graduate, had 17 points to lead the Big Red (7-7, 2-3). Longbraker and Atkinson each came off the bench to score 13 and 10, respectively, for Denison. Tia Karras led the Battling Bishops (1-12, 0-4) with 16 points, Morgan King had 12 and Sterling had 10 points and 14 rebounds. Next up, OWU continues its NCAC slate Saturday, hosting Wooster at 1 p.m.
Five players scored eight or more points as Buckeye Valley picked up a 62-50 non-league win over host Lakewood Wednesday night. The balance stemmed from the Barons’ ability to share the basketball. They finished with 19 assists on 26 field goals in their first game back on the court since a lopsided 67-25 win over Johnstown on Dec. 21. The game was tight early. Both teams scored 15 first-quarter points before BV (7-4) took a slim 33-31 edge into halftime. The Barons ballooned their advantage in the third, though, outscoring Lakewood 14-4 to take control. Alaina Radcliffe led Buckeye Valley with 16 points while Chelsea Edington and Tess Hughes finished with 12 apiece. Cami Crawford and Morgan Scowden were also steady, finishing with 11 and eight points, respectively. BV returns to league play Friday against visiting Galion.